Impact investing is an emergent investment strategy that seeks to disrupt the traditional, bifurcated systems in which governments and civic organizations address social needs, while markets, private capital and business seek financial returns. By proactively directing private capital toward opportunities that generate positive social and environmental impact as well as financial returns, impact investments use finance as a vehicle to foster collaboration and innovative solutions to societal challenges. 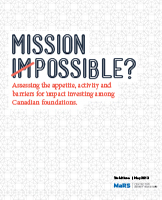 This report tracks both progress and difficulties for foundations engaging in mission investing, with the goal of informing foundation staff and board members who are considering mission investing strategies, as well as intermediaries and other market players interested in assessing gaps, bottlenecks and the forward trajectory of the impact investing ecosystem in Canada.